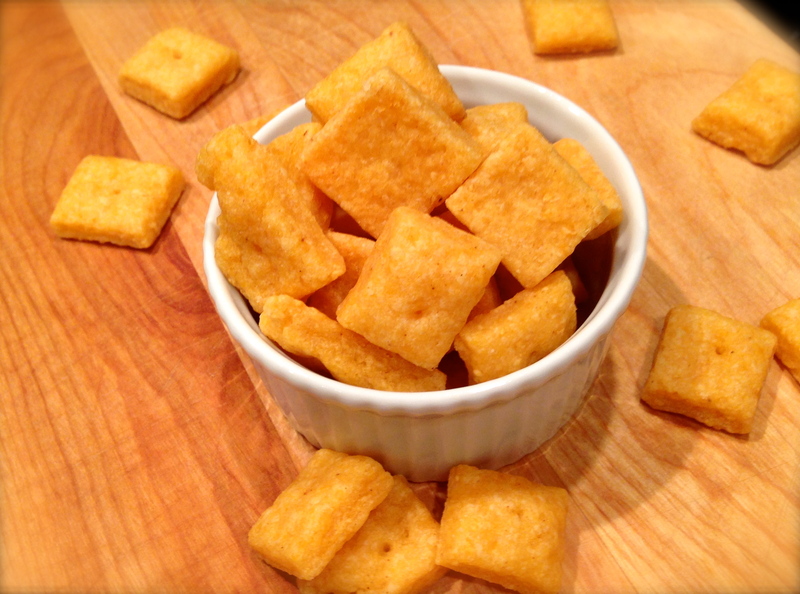 Ever thought of making homemade Cheez-It crackers before? I hadn’t either….that is, until my mom purchased Jennifer Perillo’s cookbook called Homemade with Love. In the cookbook, Perillo talks about how her girls loved those cheesy crackers shaped like a fish (Goldfish), but that she wasn’t crazy about the ingredients. Talk about processed food! Thus, Perillo decided to make her own homemade Cheez-It crackers. While Perillo’s recipe looks delicious, we made significant alterations, and thus created a homemade cheese cracker recipe on her own. As kids, my sister Brittany was the one who was obsessed with cheddar Goldfish and Cheez-Its. Come 4 pm, my sister and I would be glued in front of the television watching our favorite afternoon shows like Arthur and Zoom. I liked Cheez-It, but not as much as Brittany did. I was more of a pretzel fan. 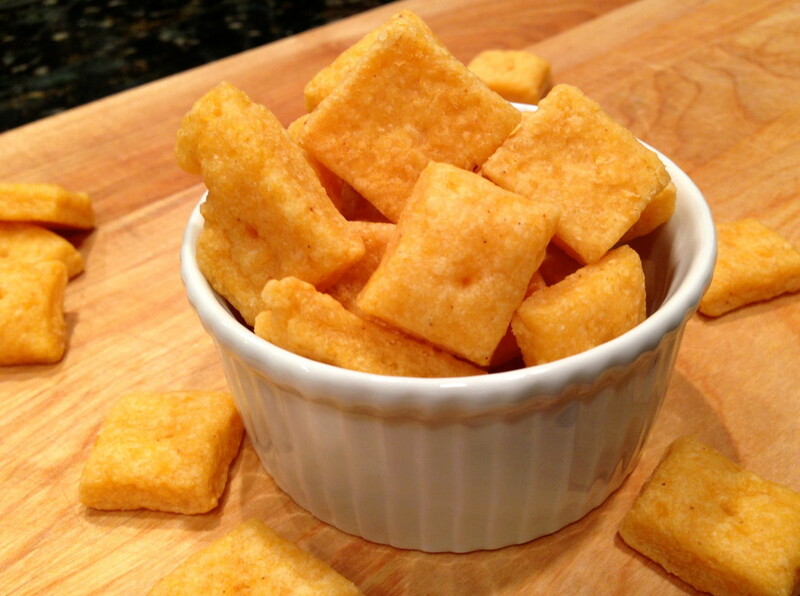 I will tell you, this recipe of homemade cheese crackers will blow the doors off of the Cheez-It brand. As Brittany describes, “Cheez-Its have a slightly burnt flavor”. That’s not the case with these crackers. 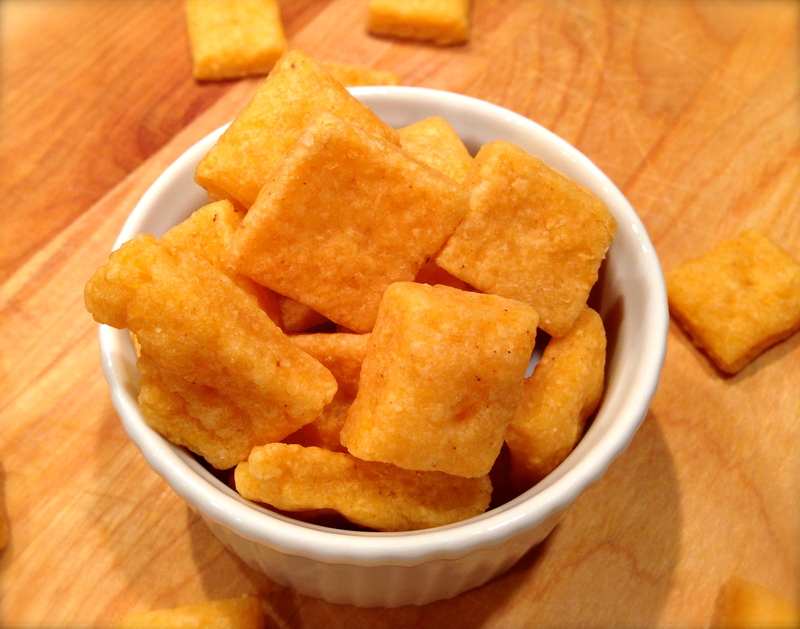 There’s something about the fresh, non-processed, and extra cheesy taste that Cheez-It just can’t duplicate. It’s kind of like eating homemade mac and cheese as opposed to the boxed version… homemade is ten times better! Plus, if you can please a bunch of 5-year olds, you’ve got a winning recipe! Mom mom teaches Sunday morning Bible class to a group of kindergarteners. For snack time, they always get a cup of regular ole Cheez-It crackers. On mom’s last Sunday of the quarter, she brought in her homemade cheese crackers and the kids loved them!! (As do I). The crackers are pretty simple, to make, so don’t be too intimidated by the instruction…they are just very detailed. Preheat over to 400 degrees F. Line two 9 x 13-inch baking sheets with parchment paper. Add the flour, salt, paprika, and mustard powder to the bowl of a food processor. Pulse once or twice until the mixture forms a sandy texture. Pour in the milk and pulse a few more times, just until a ball of dough forms. Divide the dough into two equal pieces. Place half between two sheets of parchment paper and set the other half aside. Roll out to an ⅛-inch thickness. Lift one side of the parchment, and sprinkle it with a bit of flour. Place the parchment back on top. Flip the dough over, still keeping it between the parchment sheets, and peel off the top layer of paper. Use a pastry wheel or sharp pairing knife to trim the sides to form a square (save the scraps to re-roll). Cut the dough into 1-inch squares. Transfer the cutouts to the prepared baking sheets (they can be placed pretty close to each other since they won't spread). Use the tip of a metal skewer or toothpick to pierce a hold in the center of each cracker. Bake 9-10 minutes until fragrant and the edges are golden. Keep a close eye on them, as they go from done to burnt pretty quickly. Let the crackers cool on the sheet for 2 minutes, then use a small offset spatula to transfer them to a wire rack to finish cooling completely. Store crackers in an airtight container for up to 3 days.